Every gardener has asked the question "What grows here?" Now Jim Hole helps you find the solution! Jim Hole continues his mother Lois' tradition of working with Canadian gardeners and horticultural experts to find the answers to gardening's most commonly asked question. Jim's years of experience working with, speaking to and learning from people across the country have inspired him to share solutions that help people enjoy gardening to the fullest. Read the book your questions helped create! What Grows Here? was created by bringing together Hole's customer's location-based questions, their shared ingenious solutions, and the latest product information from our team of experts. It features hundreds of today’s best plants, chosen to fill every conceivable location in the garden, including the trouble zones where nothing seems to grow. Filled with great advice, What Grows Here? provides a practical approach, showing which plants to grow where and how to tailor your gardening approach to achieve success. 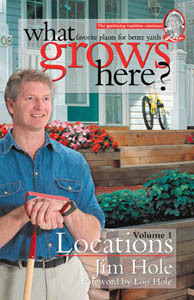 Tips for creating new yards and reinvigorating established gardens Advice for new gardeners and seasoned experts alike Hundreds of today’s best plants: annuals, perennials, trees, shrubs, roses, fruits and vegetables 75 Specific locations Hundreds of full-colour photographs Support Your Local Bookstore! All of Hole's books are available at bookstores across North America. We encourage you to visit your local bookstores and pick up a copy. ...nice to see current up to date gardening books in Alberta again!